If you bake regularly you will appreciate the labour-saving benefits of owning a stand mixer. These handy little kitchen appliances take the hard work out of mixing, kneading and whisking. Furthermore some of the best models come with attachments such as pasta makers and sausage stuffers, making them very versatile kitchen appliances. If you have decided to take the plunge and invest in the best stand mixer Australia has to offer, we have you covered. In this guide to choosing a kitchen stand mixer, we will be sharing all the information you need to know for when purchasing the best model for both your budget and cooking needs. There are a lot of stand mixer brands and models to choose from and not all of them offer good value for money. In our buying guide we will be showing you exactly what features you should be looking for when deciding which stand mixer is the best for home use. Before investing in the best buy stand mixer it is a wise decision to learn as much as you can before spending your hard-earned cash. Below you can find the main features to consider and a bit of information about each specific feature. The bowl is used for mixing ingredients and can come in a wide variety of sizes. If you do a lot of baking then you may want to think about buying a model with a large capacity. Generally speaking a good size bowl capacity is around 4L and this can be found in the top stand mixers. The best cheap stand mixer will usually have a smaller capacity. That been said there are one or two budget stand mixers in our reviews with a decent size bowl capacity. If you only bake now and again these may be better suited to your needs. The type of mixing action a stand mixer uses is an important purchasing consideration. There are two types of mixing action that can be used, these are either planetary mixing action or spiral mixing action. There are other differences between the two models more of which we will explain below. Planetary Mixer – A planetary mixer comes with a fixed mixing bowl that doesn’t rotate. The bowl can be raised into the mixing position and lowered for when removing the bowl. One of the main benefits of this type of home stand mixer is that they come with many attachments increasing their versatility. As standard a planetary mixer will come with a paddle, whip and a dough hook. The actual mixing action of a planetary mixer consists of the beater rotating in one direction and the drive shaft in the opposite. This ensures all ingredients are mixed evenly and to the same consistency. 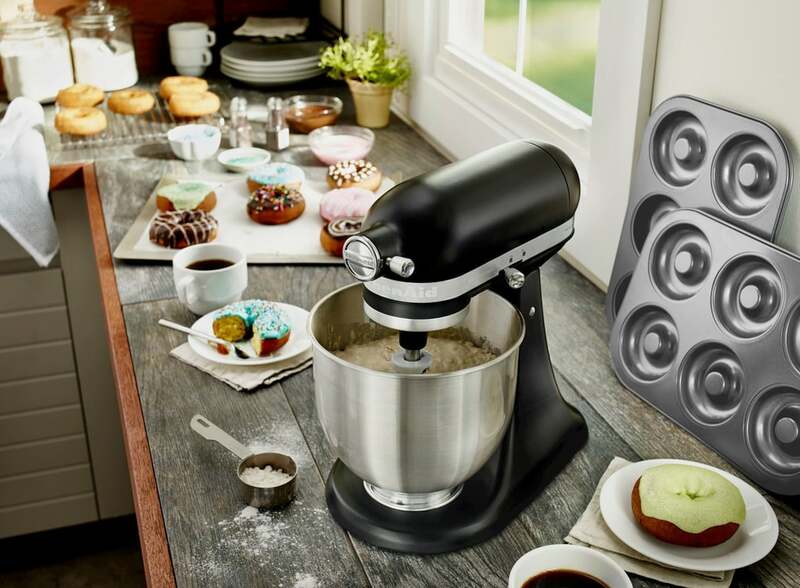 Spiral Mixer – a spiral mixer is designed to gently mix bread dough. Consequently this allows it to develop the optimum gluten structure. This is achieved due to the rotating action of the bowl this leads to the spiral hook only kneading a certain portion of the dough at one time. The benefit of this is that it creates less heat and ultimately achieves a more homogenous mix. It is worth mentioning that if you only intend to make bread or pizza dough you may want to buy a spiral mixer. Overall spiral mixers are less versatile, however, they make a good dough. Variable speed options are a must have when choosing the best stand mixer to buy. The different mixing speeds are essential for allowing you to knead, mix and whisk up a wide range of recipes. Most good quality models will have this as a standard feature. The top of the range models tend to have a more varied range of speed options than the best affordable stand mixer will have. A powerful motor with high torque is another important must have feature. The best rated stand mixer will come with about a 900 watt motor. One thing worth bearing in mind is that a small stand mixer will have a less powerful motor than a big one. A stand mixer will come with either a durable plastic gearing or a more desirable metal gearing. Metal gearing is the best choice for obvious reasons, it is far more durable. A plastic gearing system is typically reserved for cheap stand mixers and something that should be avoided if the budget allows. We all know baking can be a messy experience with flour and dough getting all over the kitchen work surfaces and floor, especially when kids are involved. A stand mixer can also get incredibly messy,however, there are ways to ensure you don’t spend more time cleaning it than using it. The best models will come with detachable beater and a dishwasher safe bowl for ease of cleaning. 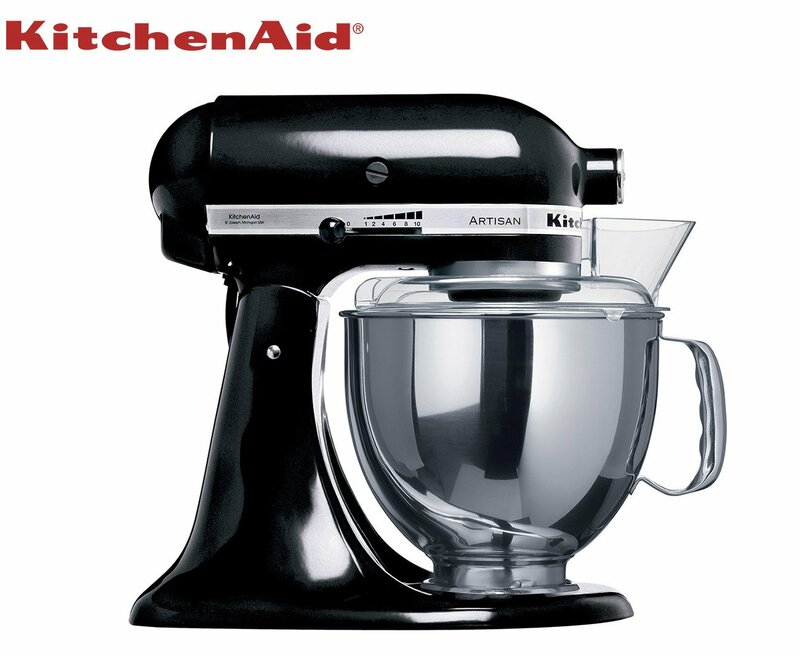 KitchenAid have been considered one of the best stand mixer brands for some time and their models never fail to impress. The KitchenAid Artisan Stand Mixer is one of the brands most popular models and it comes with very good feedback from previous buyers. The sleek and modern design and high quality features contribute to it ranking highly in many of the best stand mixer reviews. Featuring a very large 4.8L bowl it is ideal for large families or those that bake large amounts on a regular basis. 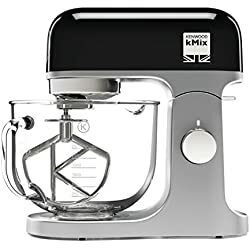 As you would expect it comes with the highly desirable planetary mixing action and the usual dough hook, whisk and beater attachments. There is the option to buy additional attachments such as the pasta maker, grinder or sausage maker. The 300W motor has no trouble coping with even the thickest of dough mixes. In total there are 10 speed settings offering a wide variety of recipe/mixing options. Made from high quality materials and offering plenty of baking options, its easy to see why the KitchanAid Stand Mixer comes recommended as the best stand mixer in Australia. Click here for latest prices and customer reviews. Another top contender for the best kitchen stand mixer is the Kenwood Chef XL. 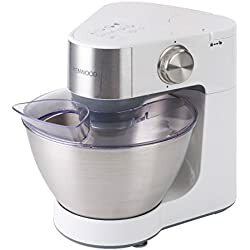 One of three Kenwood stand mixers to make it into our reviews, the Chef XL has some very good features and specifications. 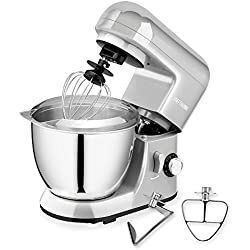 In addition to the included attachments there are over 20 more available, giving you the option to turn this stand mixer into a multipurpose kitchen appliance. With a massive 6.7L aluminium bowl you could open your own bakery with this dough mixer. The very powerful 1400 Watt motor and speed settings are super effective at making heavy mixtures such as pizza, pasta or dough for a buttery brioch an effortless task. It can also whisk up mountainous peaks of the thickest cream or create batter with the perfect rise. 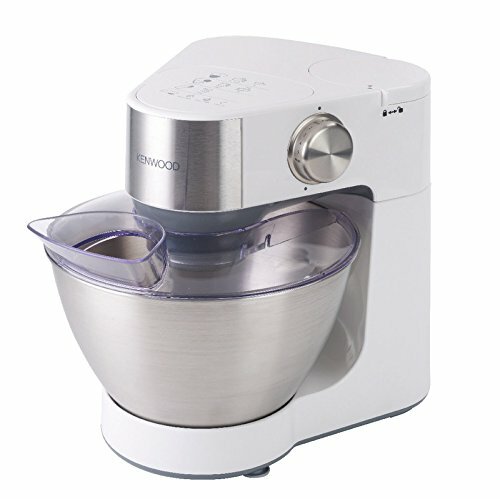 Included attachments include a creaming beater, dough hook, flat k-beater, whisk and the innovative Kenwood folding tool. The folding tool is perfect for when adding heavier ingredients to lighter ones. In addition it enables you to make mousse and souffles. The Chef XL is well worth taking a look at if you want to buy the best stand mixer for baking dough, with a 6.7L capacity bowl you will be able to make enough to feed the 5000. 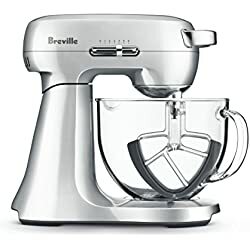 Breville are another brand with a solid reputation for making top-notch stand mixers. 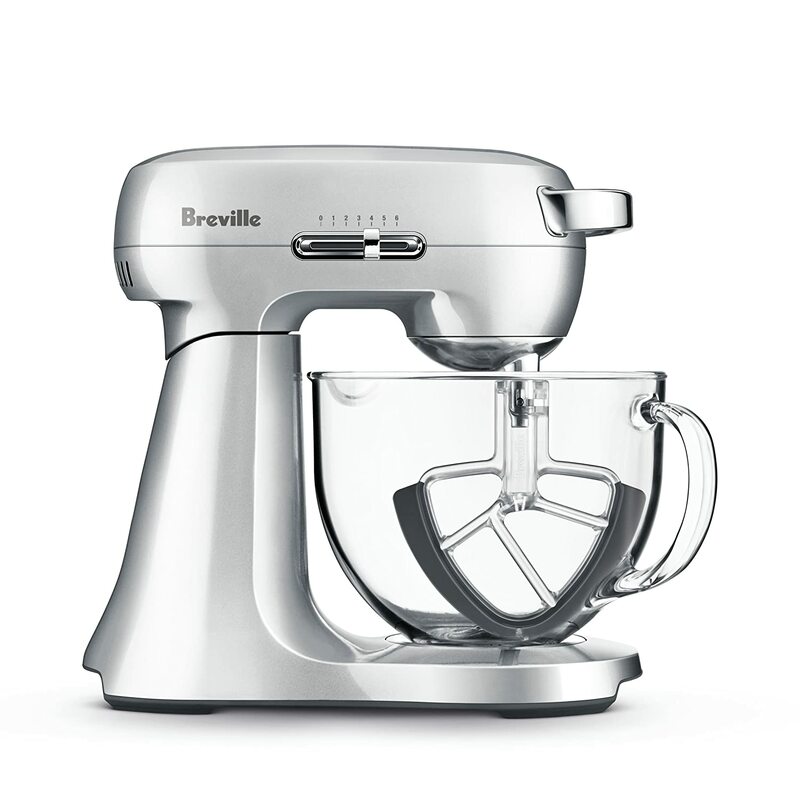 The Breville Scraper Stand Mixer is their most popular model and is heavy-duty in nature. Weighing 10Kg and having a solid design, it is very durable and will last very long time if taken care of properly. Features include a very impressive 4.7L capacity glass mixing bowl. The glass mixing bowl is resistant to thermal shock as well as being microwave safe. There are 6 speed settings and the difference between the lowest and highest is considerable, which is a positive as it allows for more mixing options. The planetary mixing action in combination with the double scraper beater ensures the sides and bottom of the whole bowl are scraped with every turn. The beater scrapes the bowl a whopping 1300 times per minute reducing mixing time by 60% when compared to previous models. The Breville Scraper Stand Mixer is more than capable of mixing, kneading and whisking anything you can chuck at it. 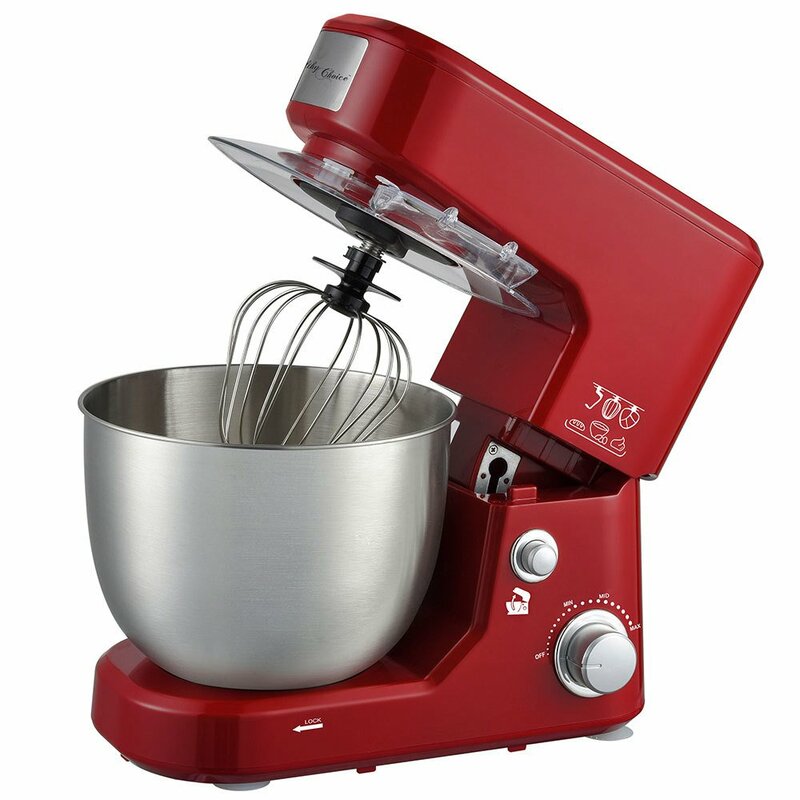 It is without doubt worthy of the title best value stand mixer. 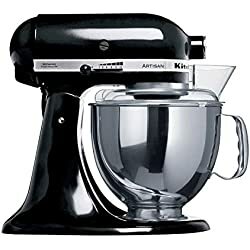 Another model from Kenwood makes it into our reviews and this time its the Kenwood kMix Stand Mixer. 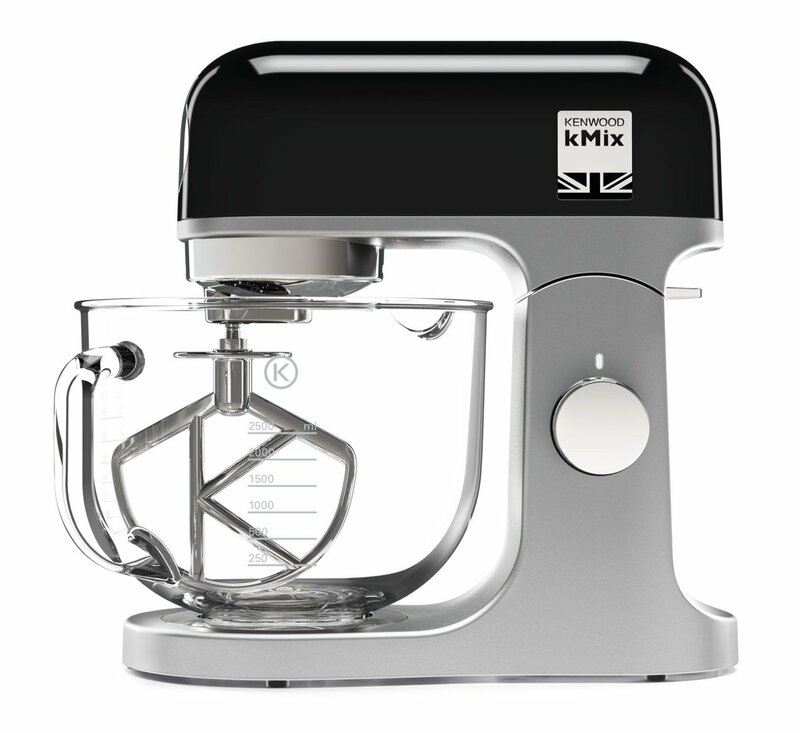 Personally I prefer the design of the kMix, as opposed to the Kenwood Chef XL, I think it looks far more stylish. Another positive is that it is considerably less expensive than the Chef XL. In terms of key features it has a 5L glass bowl, powerful 1000W motor, planetary mixing action and a range of useful attachments to choose from. These features combined ensure the kMix is fully capable of handling large quantities of ingredients and the stiffest of dough. Another positive is the unique fold function that utilises a 2.5 turn revolution mixing action. This allows you to add ingredients without losing air, which is very important when baking. The 6 speed options are well-balanced offering a good range of different mixing speeds. In addition the speed gradually builds up, which causes less mess. With a 5 year warranty and everything you need to bake a whole load of treats the kMix Stand Mixer is a great mid-price option. Yet another model by Kenwood and its the Kenwood Prospero, which many recommend as the best stand mixer under $200. 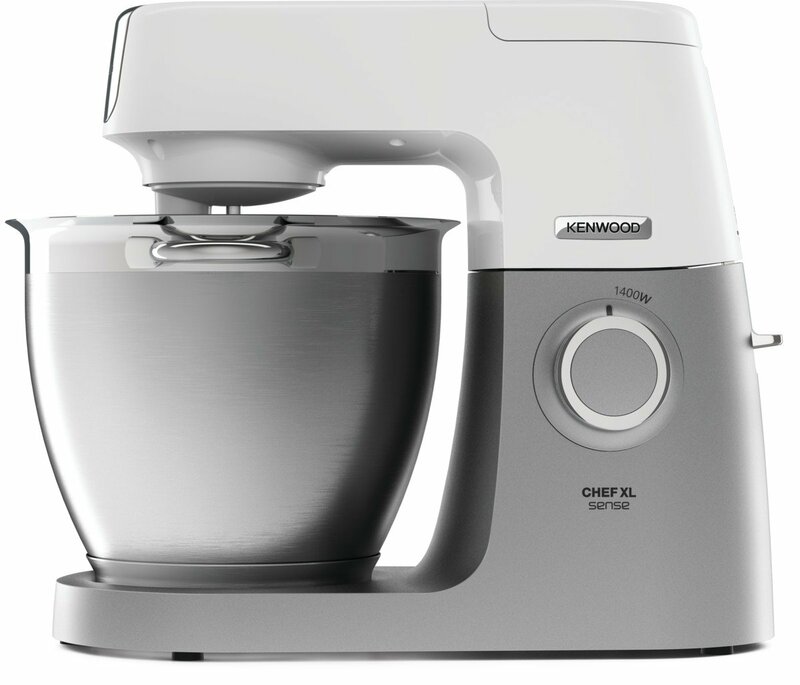 For a very affordable price the Prospero offers the high-quality features of a Kenwood product and has many positives. 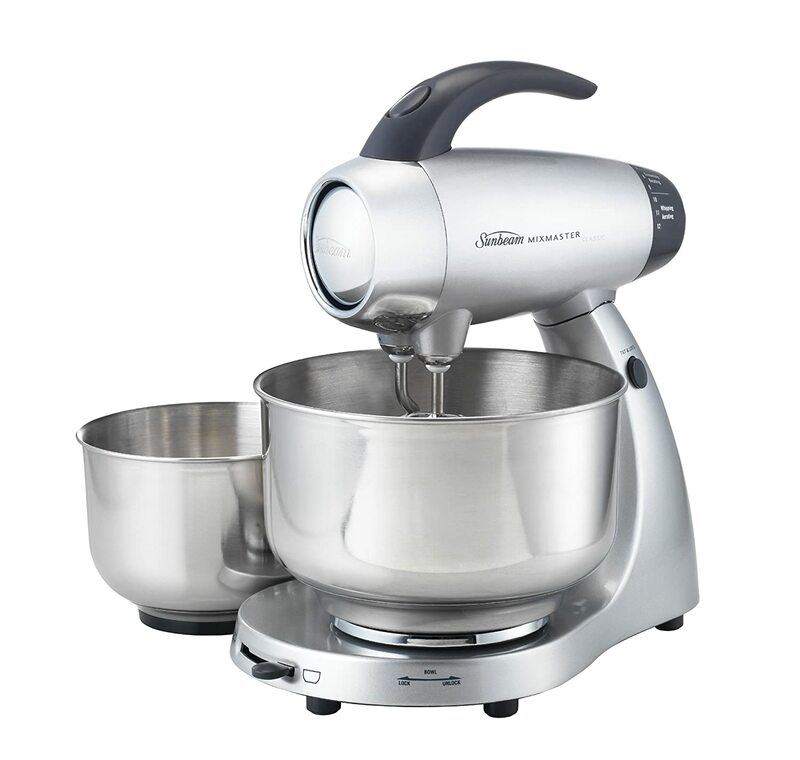 Considering this is quite a compact stand mixer the 4.3L stainless steel bowl is a decent size and suitable for baking fairly large quantities. It comes with the usual attachments these include a dough hook, whisk and k-Beater. An additional attachment is the splashguard, this is what separates the Prospero from other models. If you like to be extra clean in the kitchen when baking you will love the splashguard. It ensures 100% of the ingredients stay in the bowl while mixing. There are also variable speed settings which can be adjusted with the simple turn of a dial. For ease of cleaning attachments and the bowl are dishwasher safe. 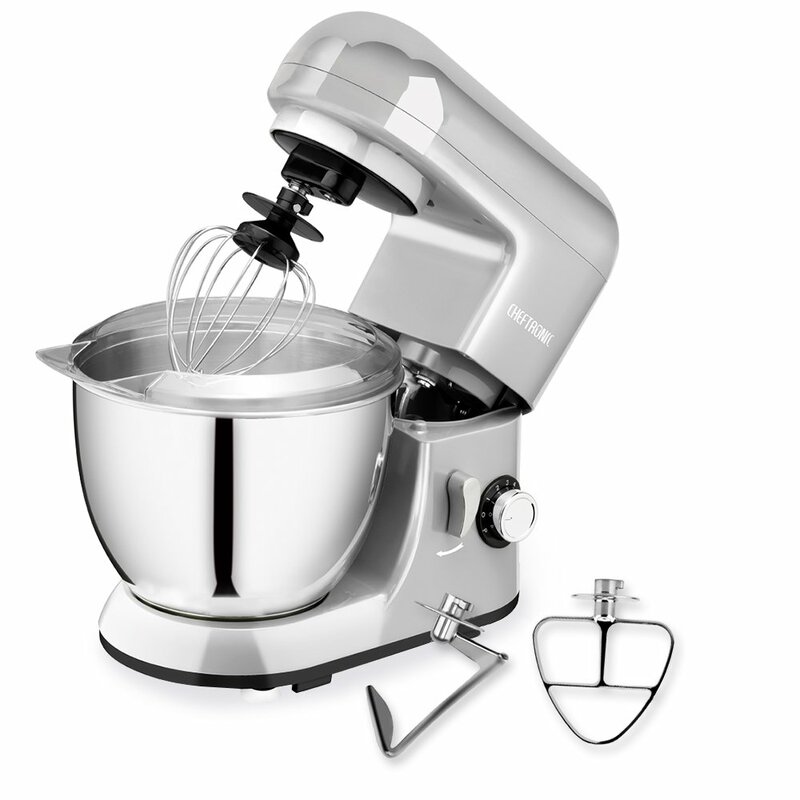 If you are looking to buy the best small stand mixer the Prospero is a top choice. For under $200 you get a high quality appliance from a leading brand. Sunbeam do a very good job at offering great value for money kitchen appliances. The Sunbeam MixMaster Classic is a prime example of the brands good mix of affordability and quality. In total there are 12 speed settings with each designed for a specific purpose. The Mixmaster Classic comes with a 500W motor, which isn’t the most powerful, however, there are no complaints to be found among customer reviews. The standout feature is the fact there are two different bowl sizes. First there is a 4.2L bowl and for when mixing small amounts a 2.2L. There is a built-in bowl selector that allows you to lock each individual bowl into a secure position when mixing. To sum up, the Sunbeam Mixmaster is worth taking a look at if you don’t want to spend over the odds on a stand mixer. It does the job it is supposed to do, if only a little less effective than more expensive models. The Cheftronic Stand Mixer is another good choice for those looking to buy the best cheap stand mixer Australia has to offer. It has many of the features of more expensive models at a fraction of the price and offers really good value for those on a budget. It comes with 6 speed settings as well as a pulse setting. With a 550W motor it is more than capable of dealing with hard to mix ingredients. There are the usual 3 attachments which are a wire whip, dough hook and flat beater. 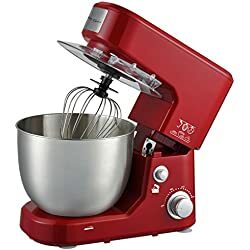 There are no extra attachments like with some models making it not quite as versatile as some other stand mixers for sale. With a 4.7L bowl, planetary action and a 2 year warranty and all the above mentioned features, the Cheftronic Stand Mixer has a lot going for it and is worth checking out if you are after a cheap stand mixer. The healthy Choice brand are another brand known for their affordable yet good quality appliances. The healthy Choice Stand Mixer is the cheapest model in our reviews at under $100 and offers excellent value. It comes with a large 5L capacity bowl that is capable of mixing up enough ingredients for either 8 dozen biscuits, 48 cupcakes, 3 loaves of bread or 2 kilograms of creamy mashed potatoes. There are 10 speed settings and an incredibly powerful 1000W motor. As you might expect it comes with the three standard attachments and features a tilting head for adding ingredients without making a mess. Hopefully with the help of our stand mixer reviews you managed to narrow the search down and find the best model for both your needs and budget. If you didn’t manage to find the perfect stand mixer then at least our buyers guide will have prepared you with all the information you need for when you do finally decide upon the best stand mixer Australia has to offer you. Check out our best food processor buying guide or for more of our home appliances buying guides and reviews here.